With prices down and weather patterns unpredictable, these are tough times for America's cotton farmers, but new research led by Z. Jeffrey Chen at The University of Texas at Austin might offer a break for the industry. He and a team have taken the first step toward a new way of breeding heartier, more productive cotton through a process called epigenetic modification. In recent decades, scientists have discovered that many traits in living things are controlled not just by their genetics—what's written in the code of their DNA—but also by processes outside their DNA that determine whether, when and how much the genes are expressed, known as epigenetics. This opens up the possibility of entirely new ways to breed plants and animals. By selectively turning gene expression on and off, breeders could create new varieties without altering the genes. In this latest study, the researchers identified more than 500 genes that are epigenetically modified between wild cotton varieties and domesticated cotton, some of which are known to relate to agronomic and domestication traits. This information could aid selection for the kinds of traits that breeders want to alter, like fiber yield or resistance to drought, heat or pests. For example, varieties of wild cotton might harbor genes that help them respond better to drought, but have been epigenetically silenced in domesticated cotton. "This understanding will allow us to supplement genetic breeding with epigenetic breeding," says Chen, the D. J. Sibley Centennial Professor of Plant Molecular Genetics in the Department of Molecular Biosciences. "Since we know now how epigenetic changes affect flowering and stress responses, you could reactivate stress-responsive genes in domesticated cotton." In a study published today in the journal Genome Biology, Chen and his colleagues at Texas A&M University and Nanjing Agricultural University in China report they produced a "methylome"—a list of genes and genetic elements that have been switched on or off through a natural process called DNA methylation. A methylome provides important clues for biotechnology firms that want to adapt crops through epigenetic modification. This methylome covers the most widely grown form of cotton, known as Upland or American cotton; its cousin, Pima or Egyptian cotton; and their wild relatives, while showing how these plants changed over more than a million years. "Knowing how the methylome changed during evolution and domestication will help bring this technology one step closer to reality," says Chen. Cotton is the top fiber crop grown in the world, with more than 150 countries involved in cotton export and import. Annual business revenue stimulated by cotton in the U.S. economy exceeds $100 billion, making it America's No. 1 value-added crop. The researchers discovered changes in DNA methylation occurred as wild varieties combined to form hybrids, the hybrids adapted to changes in their environment and finally, humans domesticated them. One key finding is that the change that allowed cotton to go from a plant adapted to grow only in the tropics to one that grows in many parts of the world was not a genetic change, but an epigenetic one. The researchers found that wild cotton contains a methylated gene that prevents it from flowering when daylight hours are long—as they are in the summer in many places, including the United States and China. In domesticated cotton, the same gene lost this methylation, allowing the gene to be expressed, an epigenetic change that allowed cotton to go global. Chen says modern breeders can modify gene methylation with chemicals or through modified gene-editing technologies such as CRISPR/Cas9. These methods could allow breeders to make targeted changes to a plant's epigenome and create new breeds with improved traits. Epigenetic breeding could be applied not just to cotton but to many other major crops such as wheat, canola, coffee, potatoes, bananas and corn. 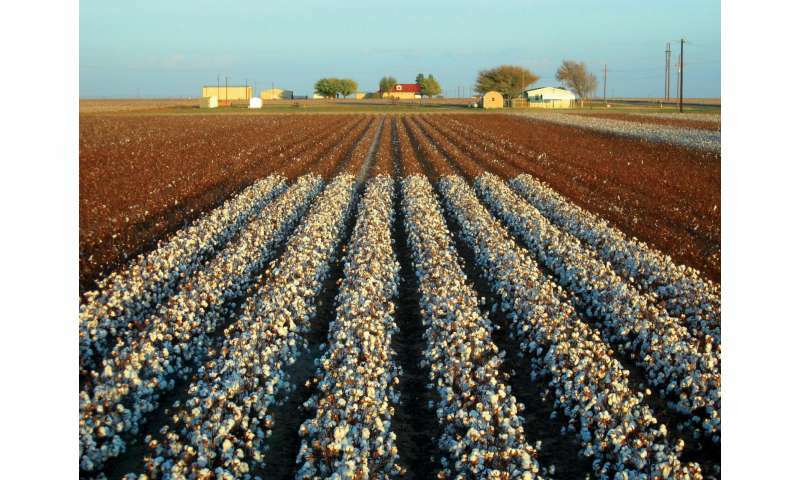 The new research builds on the most complete genetic sequence map of American (or Upland) cotton to date, which was also developed by Chen and his collaborators in 2015. 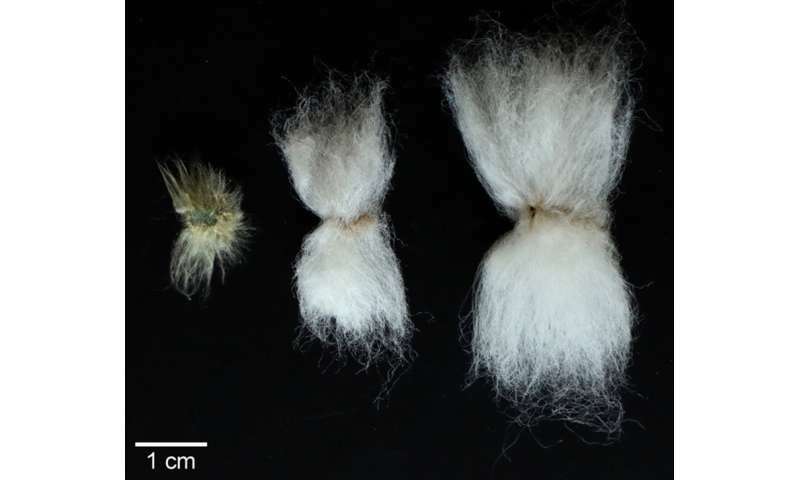 Earlier research traced the origins of domesticated cotton back 1.5 million years, when two different wild species formed a hybrid that eventually gave rise to modern Upland and Pima cotton species. Chen and his team found that the DNA methylation changes in a similar hybrid made today were shared with those in wild and cultivated cottons, suggesting that these changes have persisted through evolution, selection and domestication. That's good news for breeders who want to be sure that changes they make today won't quickly fade away in future generations. A much better crop than cotton is derived from hemp. Jeans made from hemp feel like cotton but wear many times longer.